Comedians from across the country are set to compete for laughs in the 6th Annual Improv Tournament this weekend. 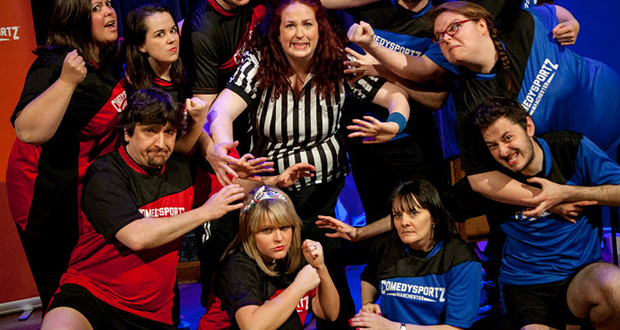 The event, hosted by ComedySportz Manchester, will take place at Sale Waterside Arts Centre on Saturday 26 September. ComedySportz’s Sean Mason said: “Improvised comedy has grown in popularity again in the last few years, both as a form and for audiences. Titles will be defended, scores will be settled and laughs will be had in this no holds barred joke-a-thon. Improv groups from around the country will be competing to take home the coveted silver plated trophy (“It’s plastic,” adds Sean). Confirmed teams include ComedySportz, CSz Sunday League, last year’s winners Discount Comedy Checkout, Impropriety, The Antics and Faffing About. Tickets can be booked for either or both of the shows in the tournament; the heats at 4pm and/or the final at 7pm. The event is suitable for all ages. Tickets are £7/£5 for either the 4pm or 7pm shows or £12/8 for both, and can be purchased online or via Sale Waterside box office 0161 912 5616.